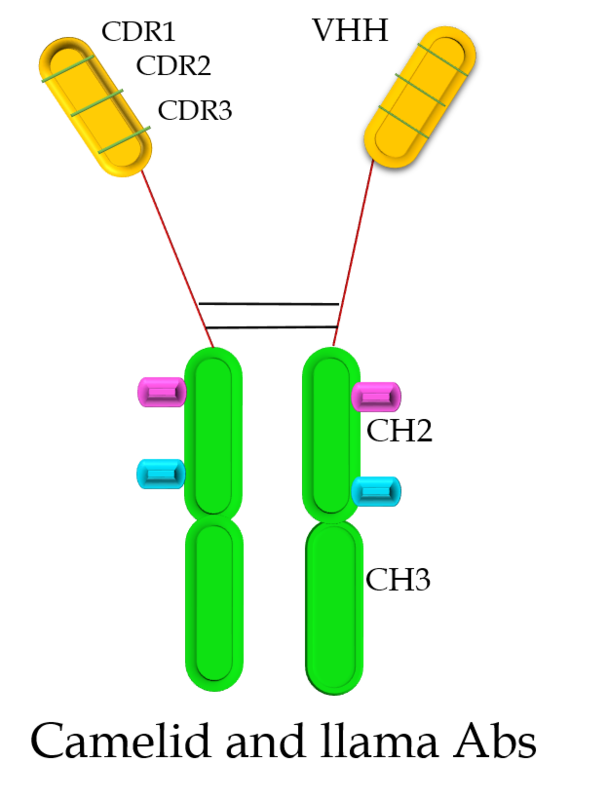 Schematic representation of naturally occurring mammalian immunoglobulin G (IgG), containing two light (L) chains (the VL and CL domains) and two heavy (H) chains (composed of the VH, CH1, hinge, and CH2 and CH3 domains). The smallest intact functional antigen-binding fragment of IgG is variable region of heavy and light chain linked by minimum 15 amino acids and maximum 30 amino acids (GGGGS) as the single chain fragment variable (scFv) or only single-domain antibody (sdAb) of VH. 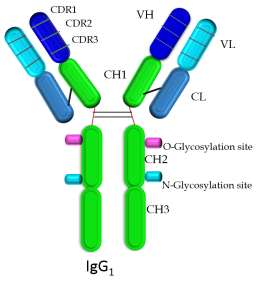 Schematic representation of naturally occurring antibody of camelids containing two types of homodimeric heavy-chain antibodies (HCAbs), which comprise only H chains, hinge, CH2 and CH3 domains. The smallest intact functional antigen-binding fragment of HCAbs is the single-domain VHH, also known as a nanobody (Nb). VHH: antigen-binding variable domain of the H chain of heavy-chain antibodies. The schematic representation of typical shark immunoglobulin new antigen receptor (IgNAR), a homodimeric heavy chain-only antibody, hinge, CH1, CH2, CH3 CH4 and CH5 domains. The smallest intact functional antigen-binding fragment of IgNAR is the single-domain V-NAR, also known as a nanobody (Nb). V-NAR: variable antigen-binding domain of the new antigen receptor antibodies in shark.